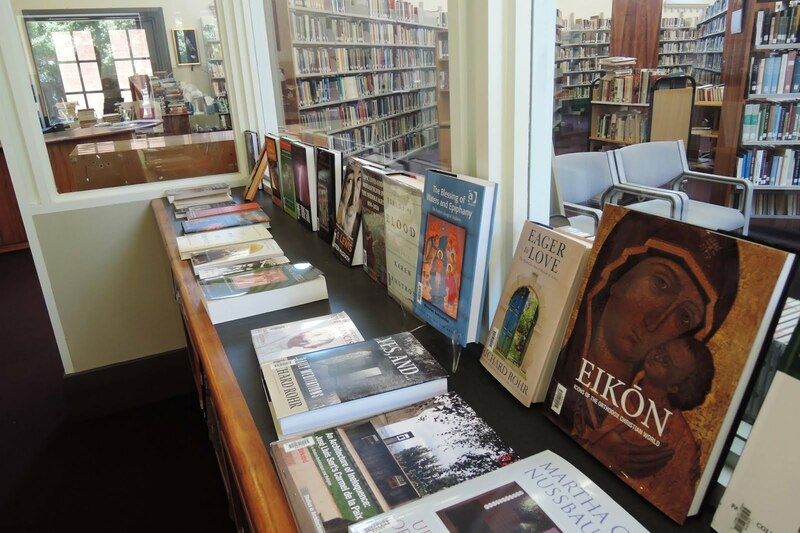 In May the Carmelite Centre and Carmelite Library held a symposium 'The Once and Future Reformation', in this the 500th anniversary of the beginning of the European Reformation. Talitha Fraser's paper was one of several describing new manifestations of the Spirit. Thank you for inviting me to share today out of the radical discipleship expression. 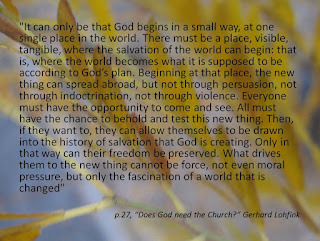 Swiss New Testament scholar Eduard Schweizer said: “discipleship is the only form in which faith in Jesus can exist.” Schweizer's Australian student, Athol Gill’s, praxis-linked theological teaching, including Mark as a Manifesto for discipleship, animated church renewal movements across Australia in the 1970-80s – many here may have heard of the House of Freedom and the House of the Gentle Bunyip. A young Ched Myers carries this teaching back to the US and it influences his own community at Berkley and presumably the study that produces the book “Binding the Strong Man” in 1988. Although I have now read it myself I was fortunate enough to first be exposed to this idea of Mark as Manifesto by Marcus Curnow who managed, with Dave Fagg and drawing on the tradition of Quaker queries and advices to synthesise Myers 560-paged book into a single A4 page (there’s a copy here if anyone wants to have a look). 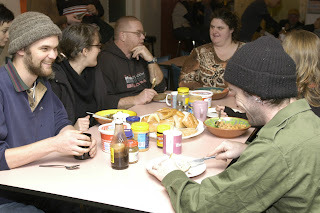 Urban Seed is an organisation that works with those who are homeless in Melbourne’s CBD –an outcome of discernment and response to Collins Street Baptist Church finding homeless people sleeping on their steps and seeking to ask, and answer, the question: “Who is my neighbour?” was to invite young interns to move into the building behind the church called Central House to engage these neighbours relationally. Jim Barr, Peter Chapman of Common Rule, Gordon Wild and Tim Costello ran various bible studies and seminar series reflecting on the work. This radical model of hospitality and engagement is still practised now with Geoff and Sherry Maddock with their son Isaac who are currently living in. Finding Seeds and Urban Seed was my first exposure to this lived expression of radical discipleship and the practice of the ideas of Street, Seminary and Sacred – that’s Ched’s language for the spheres of Christian expression: activism, education and church. In Seeds we referred to these areas as Know, Grow and Go, they correlated to Urban Seeds areas of work: Street & Hospitality, Youth & Schools, Advocacy & Engagement, Jesus’ call to preach, heal and cast out... if I may presume perhaps the three threads of the Carmelites: stillness and silence, express and explore, embrace and act. The bringing together of these ideas, or the power of what can happen in the space where these areas overlap is where I think radical discipleship happens. The etymology of the word radical is from the Latin word radix meaning root. Ched refers to radical discipleship as an invitation to join the “messianic movement of rebellion and restoration, of repentance and renewal, a “way out of no way”. · * Credentialing systems for theology students are set by the accrediting institution not the church. · * Professionalization means students need paid work to pay off student loans etc. and don’t always have the time or get given encouragement to engage in practical service to the poor or social movements. · * Regular church goers can be insulated from the insights of academics and the challenges and causes of activists. 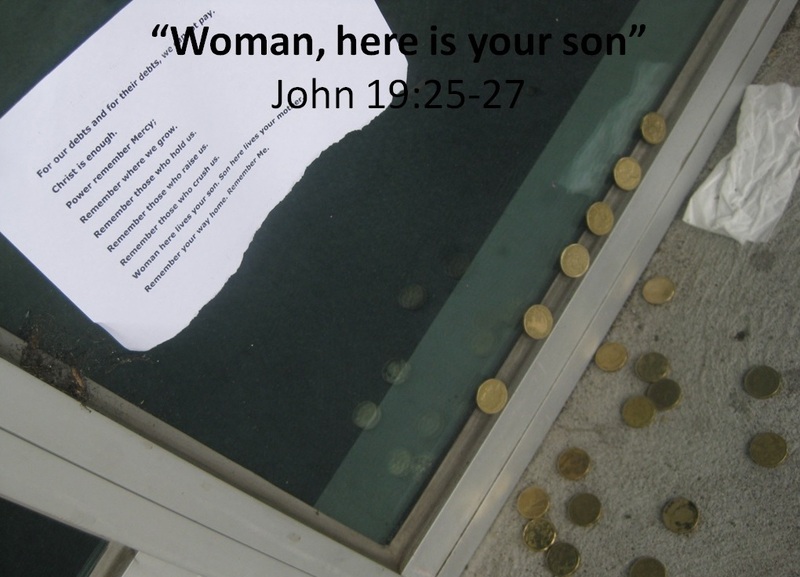 · * Faith-based activists can neglect disciplines of critical reflection – theological and political – of why they’re trying to change the world. 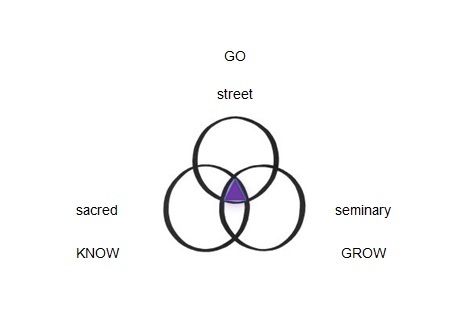 Ched believes these spheres are impoverished for being insulated from one another and says theological animation is key “to re-integrating the competencies of these alienated worlds of Christian witness”, believing that our focus instead should be in community formation, conscientization and capacity building in order to rehabilitate the church as a faith based movement of personal and social transformation. 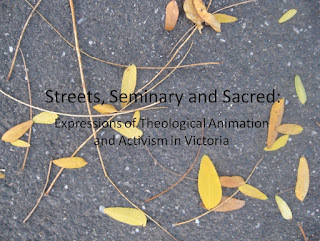 To provide some examples of what a re-integrated model might look like, I’m going to do an overlay now of a bible study series Ched did each morning of the Institute with some praxis examples from here in Melbourne and across Victoria. With this action Jesus was apprenticing himself to the peripheral, radical edge of his own tradition. The Jewish temple used water immersion for ritual purification after contact with the dead but this idea of baptism went beyond that. Jesus could have walked three steps behind a rabbi, gone to a good school but instead he chose the camel hair and honey guy. While integration might have been Collins Street Baptist Church’s original vision, I don’t know, by the time I arrived at Urban Seed both the evening Seeds church and Tuesday morning Credo Gathering spaces were operating as distinct faith-expression spaces for staff, volunteers and community members or “punters” to gather. 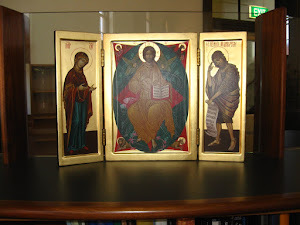 This work needed its own faith expression, it’s own language, it’s own liturgy... many songs, stories and prayers have come out of these spaces... the Seeds Sacred song, the Gospel of Vic (a version of Mark contextualised for the Australian context), the Credo Lord’s Prayer... which I invite you to say with me now: “as we were taught”. You are the best and fairest. living the way that You want us to. and to share what we have with others. and teach us to create life instead. and help us not to give up. Our safety and life is in You. As residents moved out of Central House, some asked of themselves again: “Who is my neighbour?” People consciously decided to move into areas identified as among the lowest socio-economic/disadvantaged: Norlane in Geelong, Long Gully in Bendigo and Footscray in the inner-west of the city. Each of these areas had their own Seeds church community – usually having 10-12 members – and these separate communities came together a few times a year to covenant and retreat forming the Seeds network. For many years, Urban Seed only started projects and had paid staff beyond the CBD in areas where Seeds Network groups were established. Each of these groups elected to exist in marginalised areas. While each group discerned the expression of Know, Grow, Go in their area, responsive to the particular needs and context of their community and locality, all of them shared in common projects of neighbourhood hospitality whether community dinners, craft or breakfast clubs, wood fired pizzas... all spaces like Urban Seed’s Credo cafe where people from all walks of life: lawyers and homeless, financial traders and addicts, Richmond and Collingwood supporters... preparing and sharing a meal around a common table... people of all faiths and none but for many of those “discipling” this eating and drinking together is their expression and practice of communion and church. Jesus isn’t just baptised in the Jordan but into the watershed. We understand the Holy Spirit not to exist only in people but in creation and the land... the Holy Spirit descends like a dove into Jesus. The Spirit drives Jesus into the wilderness. Jesus uses the water as a pulpit forming a natural amphitheatre, he uses farming parables, living vine and living water metaphors and calls us to ‘consider’ (learn from) the lilies. What does the land and creation have to teach us? What are the stories specific to the places we live and what are the justice issues affecting our neighbours that the good news can offer hope for? Last month in Footscray we ran a Stations of the Cross walk for Easter – we call it the way of the Southern Cross because Aunty Doreen Wandin re-named Spencer St station this, as an intersection for bus, train, tram lines it’s where many paths connect that lead us home much as people navigated by constellations. Uncle Wanta Jampijinpa has preached on the correlation of the stars of the Southern Cross to the wounds on Jesus’ body. At the Kinsler Institute, Bill Wylie Kellerman, United Methodist pastor and member of the Detroit Catholic Worker, ran a session saying that liturgy implicates. Undertaking activism on high holidays gives layers of meaning to the action. He said: “We believe God has already intervened, breaking in to break out on behalf of human kind. We recognise the authority of God [as bigger/beyond earthly figureheads of power], we believe this is the meaning of the resurrection and we have come to say so”... What does it mean for us as Christians or people of any faith – in this time, this place, this context - to be mindful of and respond well to matters of justice from a position of this belief? Myers says: “We need to reclaim scripture as our most powerful weapon of resistance. Stories are the best weapon we have”. This year’s walk visited seven sites from our shared history looking at issues we all grapple with: what does it mean for us to stand outside the home of Sally Russell Cooper and talk about recognition of Aboriginal sovereignty – a thirst that has not been quenched we are given natives to take bear home with us and plant symbolic of the hyssop branch and our commitment to work for recognition and relationship in this land. We stand outside Centrelink – “Woman, here is your son” who are we called to care for? As a parent to a child however could you count some cost of the debt of raising up that is our privilege. Standing under the Welcome Arch built by the grateful Vietnamese business community, we think of next-coming waves of refugees and asylum seekers setting out praying: Into your hands I commit my spirit... There is suffering in these events, and there are questions for us to grapple with. As we hear the words of Christ on the cross, we ask what insight might his words spoken in pain tell us? Continuing this idea of bible in one hand and newspaper in the other, Jon and Kim Cornfords work developing the Household Covenant bible study series arose out of Ched’s book on Sabbath Economics and Matt Colwell’s followup Sabbath Economics: Household Practices inspires minute incremental changes in the ways we consume that are based on biblical practices of stewardship and Sabbath and jubilee economics... from the way we see credit and debt, to growing, eating and preserving seasonally and sustainably. “As it is written...” the land we live on is filled with stories – do you know them? On the healing rites walk we told the story of deadly Aboriginal woman Sally Russell Cooper, of the transphobic attack on Starlady and her friends in Footscray, the tragic stories of Kirsty and Joan aliases used by a community lawyer talking about user-experiences at Centrelink for struggling families, the story of the Maria an asylum seeker from East Timor... these stories aren’t ‘just’ political, they’re personal. To be an active participant in restorative justice we need to know the problems of, and people directly experiencing, injustice. People may well have heard of the Love Makes A Way movement of Christians engaging prayerfully and politically for the release, in particular of refugee and asylum seeking children, from detention. What might be less known is that while some are participating in the action inside, others are participating outside: Keeping prayerful vigil, bearing witness, supplying snacks and singing. There is a Love Makes a Way songbook – as this group was looking for inspiration they turned to the Freedom Songs of the civil rights movement. Ched calls us to “sing about it until it can realised” and these songs call us into a place a freedom and hope that we will all “sit at the welcome table one of these days” together. This is a story we identified with and apprenticed ourselves to and “As I go down to the river to pray...” becomes “As I go down to Bill’s (Shortens) office to pray, welcome the refugee, let them stay” or “Were you there when they crucified my Lord?” becomes “Were you there when they turned the boats away?” ...drawing on the style we progressed to writing our own songs, and also asking ourselves whose are the local prophetic voices calling for change and Leunigs writing came to mind “Love is born in a most unlikely place”, these are words we want to believe in these times. Will you stand and sing them with me? Who are the writers in our context who are crying out for justice? Whose stories do we make time to listen to? What stories and traditions will you apprentice yourself to? Jesus was an apprentice, a disciple of kingdom, land and story... scripture study informed his political and theological practice. Our scripture study should inform our political and theological practice. The Kinsler Institute in 2015 was called “40/60/100”: A celebration of radical discipleship - closely echoing the numbers of the surprising yield of seed in good soil in Jesus’ Parable of the Sower (Mk 4:8). But for this special anniversary Institute, they alluded to two milestones that we we’re celebrating: Ched Myers’ 60th birthday, and his 40 years in the radical discipleship movement. And those numbers add up to 100—which is how many folks they were hoping would show up to join the festivities.... there were more than that: activists, academics and preachers – yes but artists, liturgists, poets, practitioners, organic farmers, the undocumented, money lenders- elders and babies, from across America and across a breadth of faith expressions. I can’t idealise these models of community – The House of the Gentle Bunyip didn’t last, Ched’s community at Berkeley didn’t last, the Seeds Network has not lasted what can’t be denied is that some expressions of the radical discipleship model continue to spring up – producing a surprising yield of seed. Jokingly referring to the Institute as a clusterfest in his closing remarks on the last day Ched noted that when the people are gathered it should always feel part birthday party, part conference, part church, part action planning meeting... I hope I’ve been able to give you some small sense of this today. Let me say to you now in closing the Seeds benediction. Spirit strengthen you in every way.